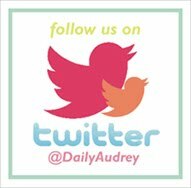 The Daily Audrey: Why Use Car Seats? You have to admit, all of the above items do make life easier for today’s parents – parents in a fast-paced technologically advanced world. Convenience is the magic word for most of us. And why would we say no? Why make things hard when we are blessed with inventions that make it easy? I personally feel that without most of the above items mentioned (I don’t own a baby monitor or diaper genie), it would be more difficult for me to be a hands on mom, especially when I’m out with the kids. Let me focus though on the first item – Car Seats. I believe that this product was a great invention. It keeps babies, toddlers and young children safe while riding a vehicle, and is convenient for parents who are traveling with their kids. 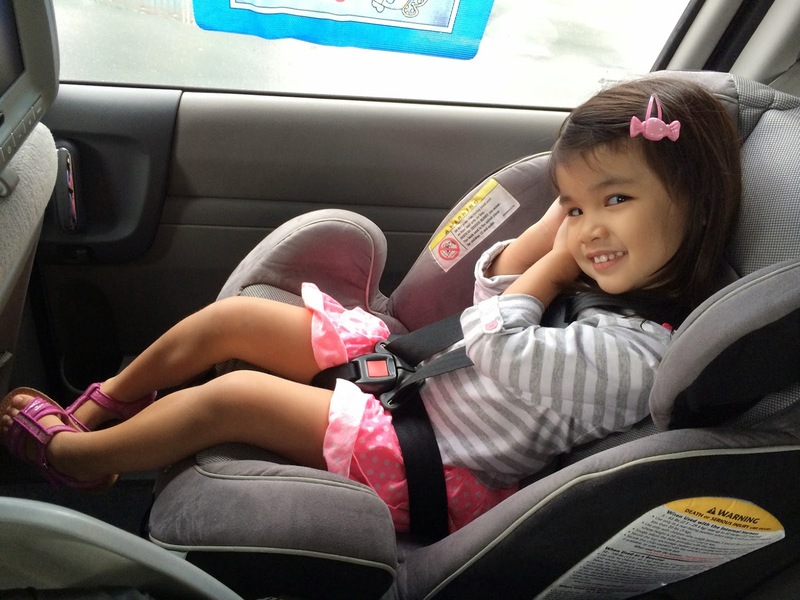 In our country, yayas if not parents, take the place of car seats. This though isn’t the safest alternative for traveling especially in highways where cars travel fast. It has been proven that car seats provide protection in the case of accidents and reduces the risk of death or serious injuries (as long as the car seat is installed properly). Check out the facts here at CDC Injury & Prevention Control: Motor Vehicle Safety. Another thing that I appreciate about car seats besides providing safety for my children is that when I drive and have no one else with me, I can travel with both my toddler and preschooler easily. They just stay buckled into their seats while I drive to our destination. Without a car seat, I don’t think I would be able to take my toddler along with me on my own (because she will most likely play with the windows and locks or bump her head inside the car while we’re moving). Car seats do provide the assistance I need when I have no extra set of helping hands (or bodies!). For me, car seats also help teach kids to be disciplined. 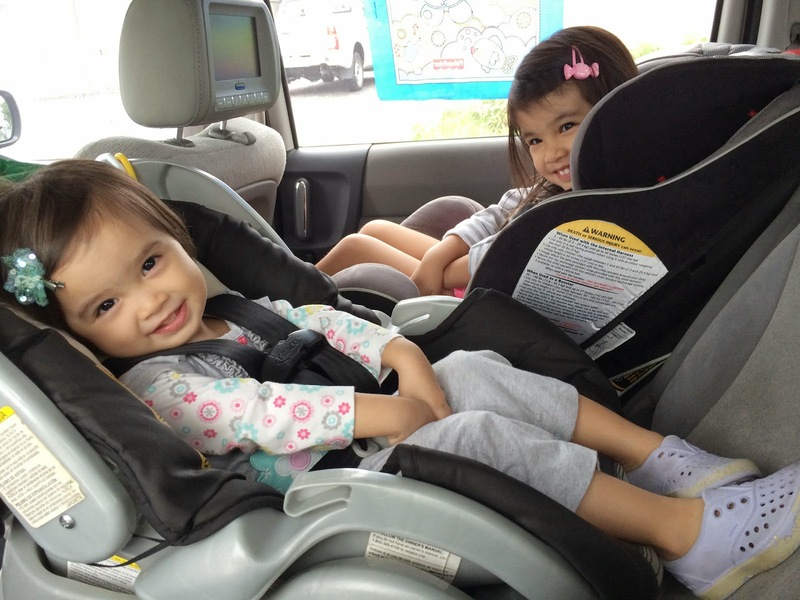 I am fortunate that my girls hardly boycott the car seat, and they know that whenever they will be riding the car or van, they will be sitting in one. No ifs, no buts. It’s just part of our rules of safety. Occasionally, my toddler Natalie would object to this when she can’t wait for her milk anymore and we just try to pacify her until we get home since it usually isn’t a far ride (and thankfully this hasn’t happened in longer trips because we make sure she’s well fed before leaving and we have snacks on the go). It really just takes getting used to for both kids and adults. This type of car seat is best for newborns/infants until the age of 2 and can be bought as part of a Travel System (which comes with a stroller that you can attach the seat to). It is also the safest type. 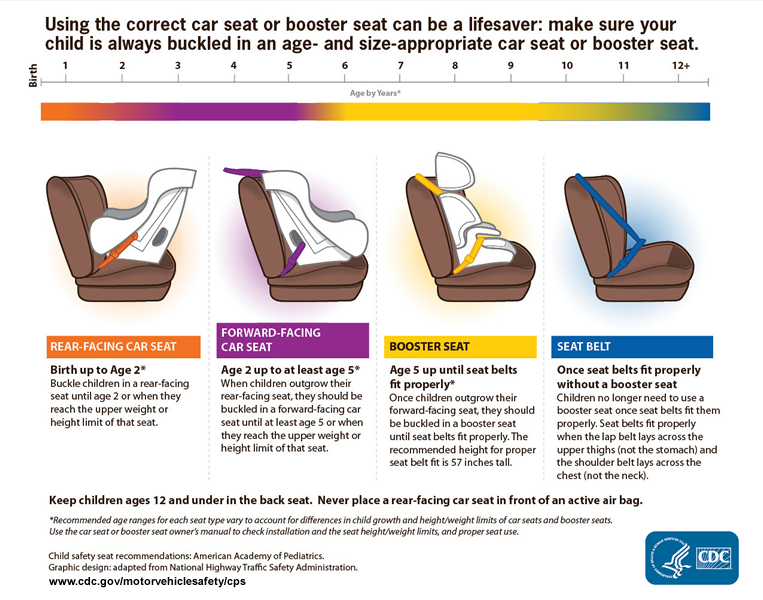 In the past, Rear Facing Car Seats were only required to be used until a child turns 1, but this was changed by the AAP (American Academy of Pediatrics) a few years ago to age 2 or until they exceed the height or weight limit. It is much safer for a child to face the rear in case of accidents, especially when a car encounters a side impact collision which is the deadliest. According to www.thecarseatlady.com, research shows that kids who sit rear-facing in a vehicle are five times safer than those who are riding forward-facing. This is because they avoid the whiplash motion altogether since the head, body and torso all move in a straight line on impact. Check out the article here Why Ride Rear-Facing. As I was also researching on car seats before Audrey was born, I came across articles about the Swedish and their almost zero record of child fatalities and injuries in car accidents. Apparently, their car seats were designed to hold kids at a rear facing position up to the age of 4-6 years. This provided protection for the head and neck, which are vulnerable body parts for young kids. Read more about it here in The Swedish Car Seat Approach. The convertible car seat is a good choice since you can install it rear or forward facing when needed. We currently use this type of car seat for Audrey, our 4 year old. She was using it as a rear facing seat until she was 2 and a half, and is now in the forward facing position so her legs are more comfy. We also have another convertible car seat on standby for Natalie when she outgrows the infant seat. You may be wondering why we didn’t just buy a convertible car seat to begin with. Well, for one – the infant car seat that Natalie is using now is actually a hand me down from Audrey and was part of a Travel System so it has a stroller that it fits into perfectly (By the way, unless you know who used the car seat previously and are assured that it hasn’t gone through an accident, it is best to buy it new. You don’t want to use a second hand car seat that can compromise the safety of your child). Another good thing about it is that it’s easy to take out from the car (or from its base which is strapped into the car), and take with you anywhere (can't do this with a Convertible Car Seat). So if baby is asleep you don’t need to take her out from the car seat (or risk waking her up!) – you just take the car seat with you. Second, my children are on the petite side so starting with a convertible car seat isn’t exactly a good idea because it's bigger. I don’t know how many more infant head support pillows I will need to fit my baby in one in order to prevent her from moving around and about. 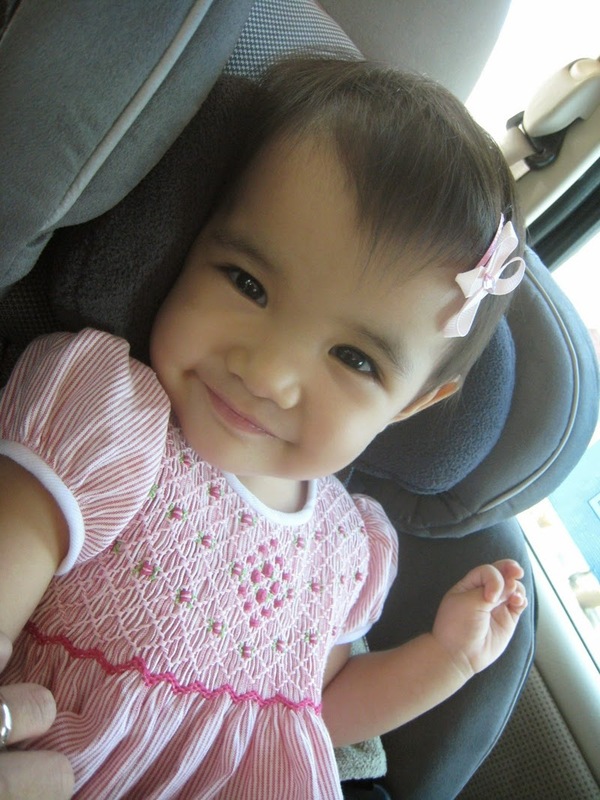 An infant car seat is also safer for younger babies according to experts so having two kinds is ok with us. 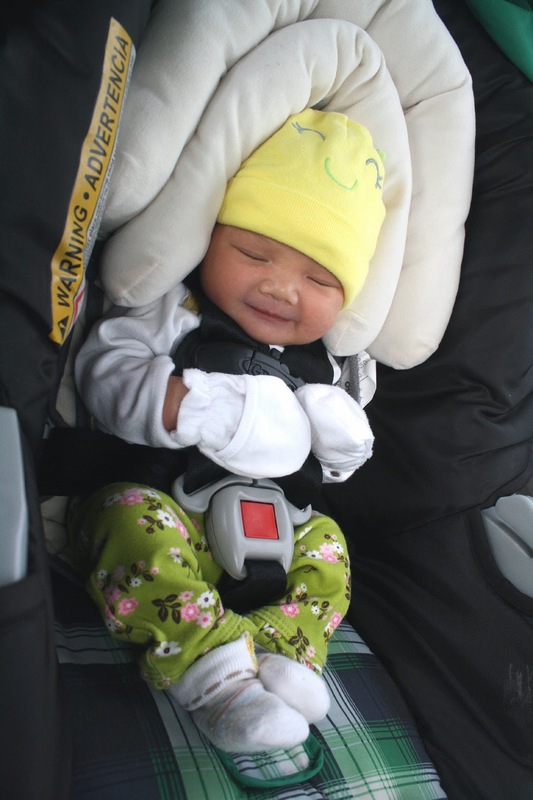 Newborn Natalie snug as a bug in her infant car seat! A lot of car seats are now available here but the convertible ones that we own are both an Evenflo brand and were ordered through Amazon.com. Our family just helped us bring them home from the US since they came out cheaper if we bought them from there ;) We got the Evenflo Symphony model which is similar to the one featured below (except for the fabric used). We were happy with Audrey's so we got the same one for Natalie. This one is for children who have reached the height limit of the Rear Facing Car Seat. You can find 3 kinds of Forward Facing Car seats: A Convertible Car Seat – as mentioned above, A Combination Car Seat which is a Forward Facing Car Seat that can also become a Booster Seat (for older children or those who have gone over the height or weight limit for Car Seats), and just a Forward Facing Car Seat. A car seat such as this keeps a child safe through a 5-point harness so they are secure in the seat and forces are distributed evenly in the case of a crash. This is for older kids who can’t fit in seatbelts well enough and have gone over the limits for car seats. 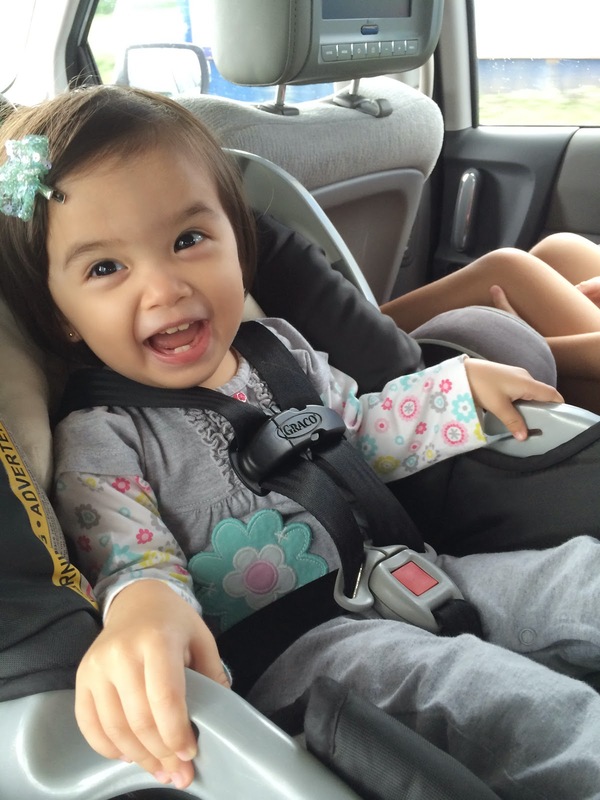 See this article from The Car Seat Lady to know when a child is ready to use a booster seat. I hope you would seriously consider using appropriate car seats for your child, but if this is simply not an alternative, then make sure that you always make your child stay in the back seat with someone, and NEVER ever let him or her sit in front. I have heard of accidents that proved to be fatal because a parent allowed their child to sit in front while sleepiness made them lose control of the wheel. Don’t let this happen to you. Better to be safe than sorry. And if your child or children ride in car seats and are strapped in whenever you are on the move, please don’t forget to wear your seatbelt as well! Keeping your children safe is a priority, but if you don’t wear your own seatbelt and get into a crash, you put the other passengers inside your car in jeopardy. Our bodies are thrown with a force 30-60 times our body weight during a crash impact so we can hurt other people inside the car when we aren’t strapped in. So as responsible adults we should also remember to buckle up! 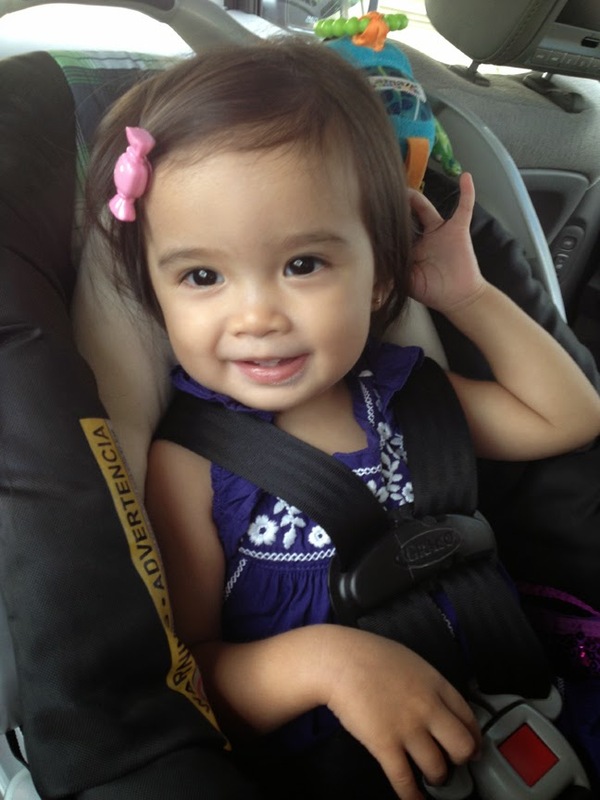 See CarSeats: Fast Facts and How Child Car Seats Work for more info.